The U.S. Treasury maintains a very interesting website that tracks detailed information about the national debt. One of the reports on the website the “Monthly Statement of Public Debt.” This report shows the total outstanding debt for the U.S. Government as of the end of each month. Click here to see report page. The report for July was released a few days ago. It shows that the national debt has increased by $1.063 trillion dollars in the first ten months of this fiscal year. (Note: the federal government is on a September 30 fiscal year end.) The total national debt now stands at $21.3 trillion, which, of course is an all-time high. 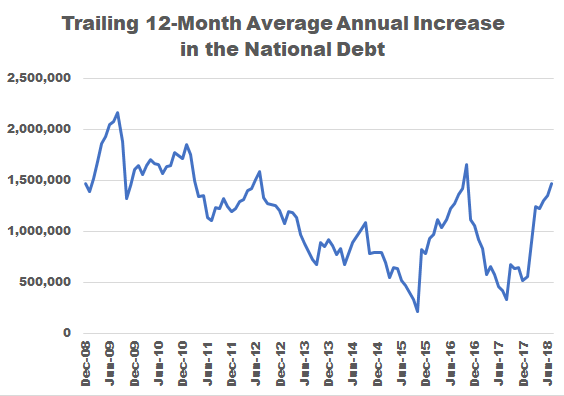 The change in the national debt from month-to-month is pretty erratic, but we can get some idea of how fast it is going up by looking at the trailing 12-month total increase. This is what the looks like charted. Of course, the national debt increased dramatically during the 2008-2008 recession when federal tax receipts plummeted, and expenditures continued to increase, including the one trillion dollar stimulus. But the increases declined significantly as the economy recovered and sequestration was adopted. There was a spike in late 2015 and 2016 when Congress made significant exceptions to sequestration and federal spending “caught up.” The average dropped again after that until mid-2017. Ever since then it has been nearly straight up. 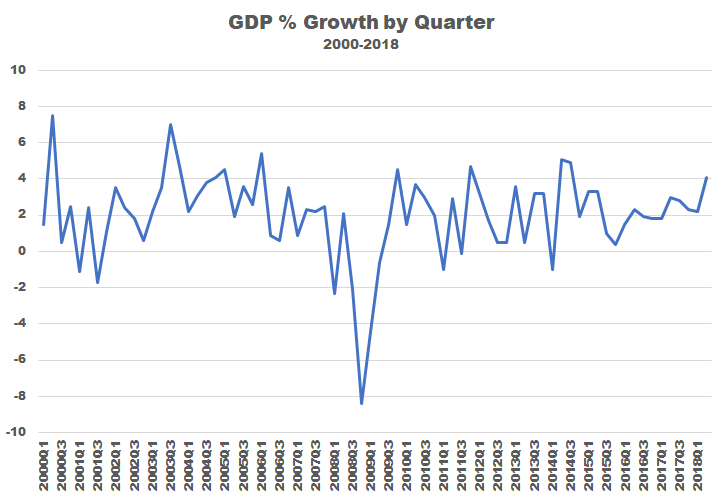 Of course, Republicans insist that the tax cuts and regulatory relief are going to increase economic growth and as a result federal tax receipts will increase. I am skeptical. There has never been a consistent correlation between tax cuts and economic growth, much less any increase in federal receipts. And so far, economic growth, while encouraging, has hardly been remarkable, notwithstanding the current political hype. I am not one of the Cassandras that believes that a catastrophe is just around the corner because of the ever-rising level of the national debt. Our national debt is currently closing in on 100% of GDP. There are other advanced economies, like Japan, that carry much higher levels. However, there is no doubt that higher debt levels are a headwind for future economic growth. 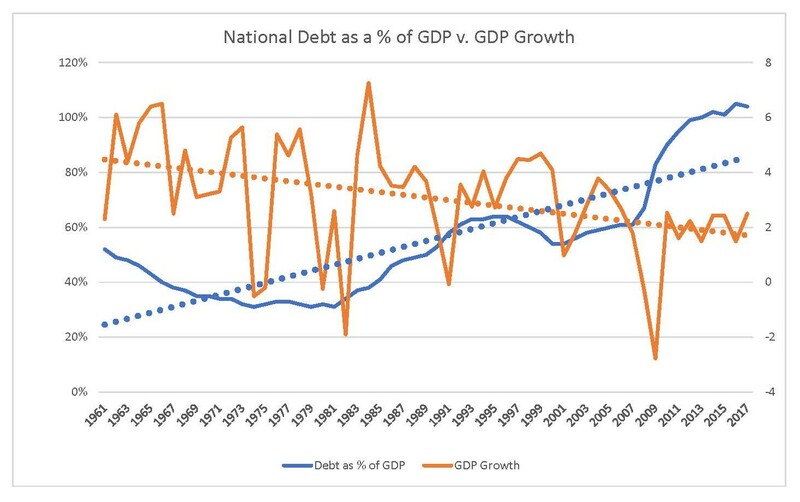 There is a nearly perfect correlation in increase of the national debt and the long-term decline in economic growth. Obviously, there are other factors at work here and correlation does not necessarily imply causation. But just about all economists agree that unless we get the increases in the national debt under control, we will be leaving the prospect that our children and grandchildren will not enjoy the standard of living we have.